So many facets of Edgar Allan Poe’s life, death, and his marriage to his 13-year-old cousin are mysterious and unconventional. Poe was born on January 19, 1809, in Boston Massachusetts. His parents, David Jr. and Elizabeth Arnold were both actors. When he was three years old, his mother died and his father left leaving Poe, and both his older brother and younger sister as orphans. The children were split up and relocated to different homes, with Poe moving to Virginia to live with godparents John and Frances Allan. The family never formally adopted him but treated him well and like their own child. Frances was particularly close to the child. As he grew into a teenager, tensions rose between himself and John Allan, who did not agree with his desire to become a writer. Allan felt Poe was ungrateful and removed him from his will. In 1826, Poe enrolled in the University of Virginia. Having no money, he ended up gambling to pay bills and buy food. Poe was not very good at gambling, and lost two thousand dollars in eight months. When he went to Allan for help, he was turned down. This caused problems between the two men which could not be fixed. Poe, therefore, left the household permanently in 1827. Having no finances or a place to stay, he joined the army for a five-year term. He also published, in 1927, “Tamerlane and Other Poems.” The effort was a failure. In January, 1829, Poe became a sergeant major in the Army. He got tired of the army and wanted to leave. Poe arranged for a discharge on the condition he would join West Point Academy. He thought this would please Allan and would be able to get help from him financially. At 20 years old, Poe moved to Baltimore and resided with his aunt Maria Clemm and Virginia who was her seven-year-old daughter. In 1831 he published “Poems By Edgar Allan Poe” and started to write for magazines. The author and Virginia became good friends. When Poe became interested in one of the neighbors, Mary Devereaux, Virginia helped him woo her by delivering to her love letters from him. When 17-year-old Devereaux rejected him due to his excessive drinking, he became interested in Virginia who adored him. The two decided to marry, but Virginia’s mother did not approve of the union. There was a 13 year age difference, and the author’s financial situation was bleak, having been fired from the Southern Literary Messenger for coming to the job drunk. The twosome traveled to Baltimore and eloped on September 22, 1835. The groom was 26 years old, and the bride was 13 years old. However, on the birth certificate, Virginia’s age was listed as 21 years old. They renewed their vows and had a public ceremony in Virginia on May 16, 1836. In January 1842, while playing the piano, Virginia started to bleed from her mouth which was the start of Tuberculosis. Unable to cope with Virginia’s illness, her husband began to drink heavily. In 1846, she told a friend that it would be her time to die soon, and she wanted to spend her final days making her husband happy. After 11 years of marriage, Virginia died on January 30, 1847. 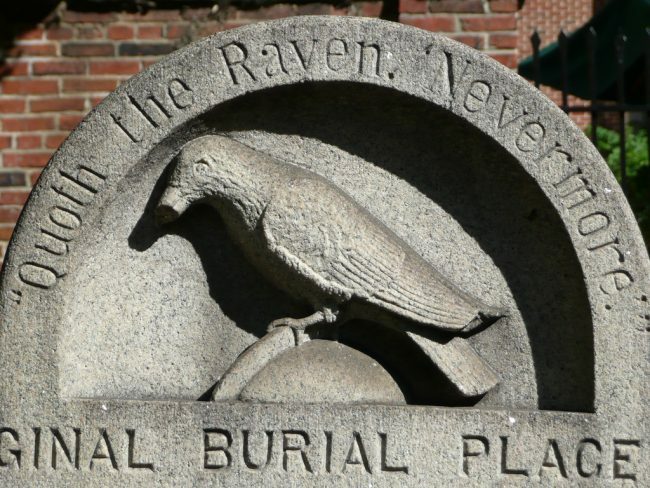 Some have theorized that Virginia is the dark-haired woman who dies in so many of the author’s stories, such as “Ligeia,” “Annabel Lee” and “The Raven.” Others disagree with that theory because Poe saw other women before Virginia’s death and after. Nobody will ever know who Poe was thinking about when he wrote his poems, and it will always be a mystery, like so many other aspects of his life. One Response to "Edgar Allan Poe Married His 13 Year Old Cousin"
Hi! I know this is kinda off topic nevertheless I’d figured I’d ask. Would you be interested in trading links or maybe guest authoring a blog post or vice-versa? My site discusses a lot of the same subjects as yours and I believe we could greatly benefit from each other. If you happen to be interested feel free to send me an email. I look forward to hearing from you! Fantastic blog by the way!